The vision of Lutheran Men in Mission (LMM) is for every man to have a growing relationship with Jesus Christ through an effective men’s ministry in every congregation. Lutheran Men in Mission ministers to men of all ages. A special focus is ministry to younger men. To raise necessary funds through individual gifts to meet the needs of men's ministry in local congregations and to insure that we will continue to reach more men for Christ. 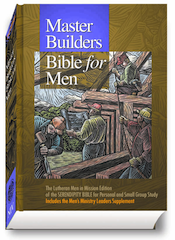 LMM will provide "Master Builders - Bible for Men" to help start a bible study program within a congregation.